Largely missing from the flood of remembrances of the late President George H.W. Bush is the role he played as Ronald Reagan’s vice president in what came to be known as the Iran-Contra Affair. It’s an episode that clouded an otherwise remarkable career in public service. Perhaps Bush’s most well-known involvement in the affair was his absolution of some of those in the know about it. On Christmas Eve of 1992 – six weeks after losing his bid for a second presidential term to Bill Clinton — Bush pardoned six members of the Reagan administration who’d been charged with crimes ranging from perjury, to lying to Congress, to obstruction of justice. All those charges stemmed from attempts by senior Reagan administration officials to cover up a covert White House operation whose disdain for established law and outright deception marred Reagan’s tenure as well. Selling weapons to Tehran, which was at war with Iraq at the time, had two objectives. One was to enlist Iran’s assistance in freeing American hostages being held in Lebanon. Among them was William Buckley, the CIA station chief in Beirut. Buckley was ultimately killed by his captors, though other hostages were released. Bush’s grant of pardons came 12 days before Caspar Weinberger, Ronald Reagan’s defense secretary, was to go on trial. Weinberger had been charged with obstruction of justice and lying to Congress about the arms shipments to the Contras. The focus of that trial was to have been a private notebook of Weinberger’s which contained references to Bush’s knowledge of the illegal arms sales to Iran. The independent prosecutor’s quarrel with Bush was not limited to the late president’s pardons, which effectively scuttled Walsh’s investigation just as Bush was leaving office. 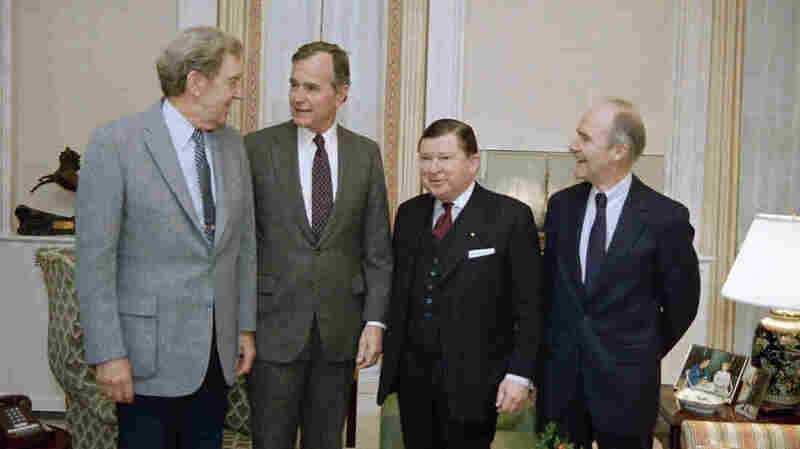 Walsh also pointed to what he labeled Bush’s “misconduct” for having failed to turn over to the investigation until only that same month a campaign diary begun in 1986 containing what the special prosecutor called “highly relevant contemporaneous notes” regarding the Iran-Contra scandal. Bush had repeatedly insisted he was fully cooperating with that investigation. “I have nothing to explain,” he told the Los Angeles Times three months before relinquishing his campaign diary. Bush’s role in Iran-Contra was perhaps most memorably dissected during a remarkable live interview he did with CBS Evening News anchorman Dan Rather in January 1988. At the time, Bush was still struggling to win his party’s presidential nomination and was eager to appear on the nation’s most widely viewed TV evening news show to boost his political fortunes. Bush ignored a question from Rather about whether he was concerned about sending missiles to Iran’s Ayatollah Khomenei. Rather reminded Bush that as vice president he had claimed to have been “out of the loop” about Iran-Contra. Bush would go on to win a single term in the White House, years that were dogged by Walsh, the independent prosecutor, trying to get to the bottom of how much the 41st president had known about the arms-for-hostages-for-arms scandal – and how much he’d held back evidence of what he’d known and when he knew it.